Lib Dem Liar David Watts has been up to his old tricks again. Obviously having too much time on his hands standing as the PPC for Skegness, he’s launched a broadside against me claiming I’m a Labour Activist AND somehow singlehandedly wanted to bring in ID cards for the UK. David has a history of lying for political gain. In 2010, he fed me a load of false info in the pretence of a leak. I saw it for what it was, and didn’t publish, yet Watts assumed I did, and ran an article about ‘The truth, contrary to rumours put about by Beestonia…’. When I asked for an explanation, none came. Watts is a desperate man. 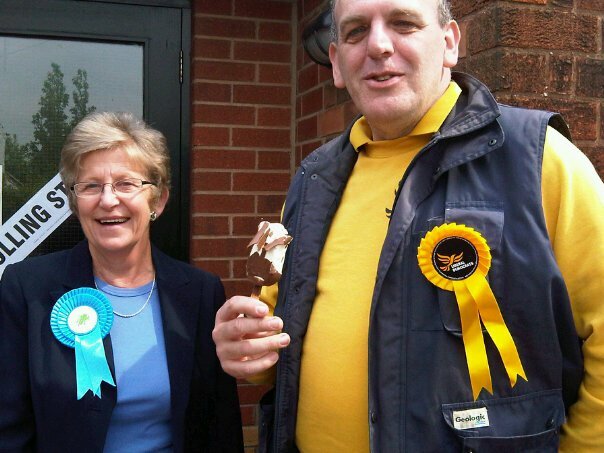 After achieving the splendid accolade of becoming the worst Lib Dem by-election candidate in post-war history, he has led a negative campaign of half-truths, misrepresentations and cynical claims, entirely contrary to the polite, mannered and positive PPC, and fellow Lib Dem Bramcote councillor, Stan Heptinstall. He’s now clinging onto his political life, and will probably pay for his negativity with a welcome shunt into oblivion come the election. I have sent him a response to explain his slur, and in the name of transparency, have printed it in full. I await a response…. I noticed that you have publicly stated on the Bramcote Today forum that I am ‘A Labour Party activist’. This is slanderous, and, I suspect a little bit sexist. I have never worked, volunteered, or in anyway aided the Labour Party. My wife is, however, a member and activist. We have a strict rule in the house that I do not even fold a leaflet for her. Certain rules in my employment mean that I cannot support any party. By having yourself as a public figure in a position of authority state this mistruth is both libelous and malicious. While never making any pretence of neutrality, I am proudly, and necessarily independent. I suspect that a rather misogynistic attitude towards my wife has driven this accusation, that somehow she cannot have independent thought and must be being controlled by me. My wife is a successful bio-chemist researcher, researching ways to combat cancer and other diseases. I can assure you she is no hand-puppet of mine. This is a dreadful slur to make. You also allege that I am somehow responsible for the introduction of ID cards. This outrageous claim has absolutely no grounding in reality, and thoroughly misrepresents my position on ID cards: I was heavily involved in the NO2ID campaign for many years, and still to this day am very anti their introduction. To suggest that in some way I condone them is wholly untrue, and damaging to my long-term work as a campaigner. I realise that their is an election on, and that things get hotheaded. I am aware your style of campaigning is pugnacious. I’ve met you many times in person, and I have never doubted you are a nice guy. Yet to make these slurs, from a position of power, is a disgrace, and brings the council you represent into disrepute. I request that you remove the statement from the forum and instead put up an apology, in line with electoral practice policy and general politeness. I have copied the the Chief Executive and the Legal Exec of Broxtowe Borough Council for full visibility and accountability purposes. I’d send this to the Skeggy media too, but since Watts seems set to get a vote so small electron microscopes are being delivered to the Returning Officer right now, I won’t bother. The Lib Dems locally are a peculiar lot. I tried to debate them their support for austerity a couple of years back (in Beeston town centre) and when they didn’t like my tone one over-sized idiot sporting their silly yellow rosette literally bounced me 2-3 times with his big belly (no mean feat given I am not exactly slim). Once I stopped laughing at his shenanigans I realised he was seriously trying to bully me away. What strange behaviour these Lib Dems get up; lying and bullying when presenting themselves as a party of decent people. The evidence suggests they really are a desperate lot.